Spain wants to "bring an end to independence as a political option." This is what Carles Puigdemont said from Helsinki on Friday, after finding out that the Spanish judiciary try him for rebellion and misuse of public funds. The deposed Catalan president stressed that his prosecution is part of the "big political case" against pro-independence leaders. He also accused Spain of "forcing people into exile or prison for political reasons." "What should we do," he asked, "disappear off the map?" After taking part in a talk at the Helsinky University, the deposed Catalan leader said that Madrid wants to use legal actions to acheive what it could not in the December 21 election, in which pro-independence parties won a majority in the parliament once again. He insisted that the pro-independence bloc in parliament will not "betray" the election's result. According to Puigdemont, Catalan political leaders are working "in an unknown field," and pointed out that if a new election is held in Catalonia, that would be because "Spain has caused it." Asked about the pro-independence party's strategy against Spain's decisions, Puigdemont noted that parties in favour of a Catalan state are working to swear in a president picked by the Catalan parliament, not by the Spanish judiciary or the Spanish government. The Catalan president, removed by Madrid after the enforcement of Article 155 of the Spanish constitution, noted that pro-independence parties are "absolutely vowed" to avoid another election. The country has been under rule from Madrid since October last year, and without a president since the December 21 election called by Madrid, as two candidates proposed so far, including Puigdemont himself, have been rejected by the Spanish judicial system. From Finland, the Catalan leader expressed “absolute support and respect” for Marta Rovira's move, who announced that she went "into exile" on Thursday. He believes it is “a good decision to continue defending” her rights and those of all Catalans. On Thursday, the Catalan leader met some MPs from the Friends with Catalonia group in the Finnish parliament. On Friday, he took part in a talk at Helsinki University. 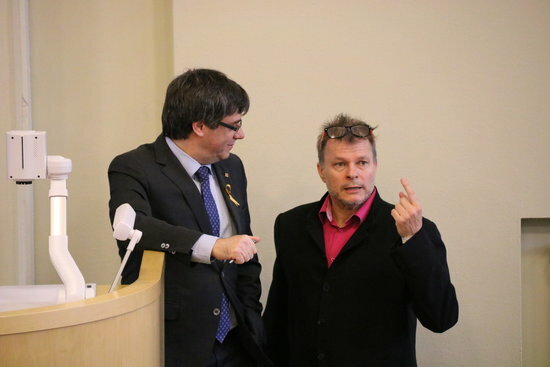 The deposed Catalan president is in the nordic country at the invitation of the Friends with Catalonia association, which was set up in 2016, and is chaired by the Centre Party MP Mikko Kärnä, who invited Puigdemont to the country. This trip came after Puigdemont took part in discussions on the current political situation in Catalonia, in which a solution still seems to be far out of sight, as well as attended meetings on the Catalan issue in the United Nations HQ in Switzerland earlier in the week.